Lalbaugcha Raja 2017 First Look; The popular festival that is celebrated as the birthday of Lord Ganesha in Hinduism will be celebrated all over the country on Friday, August 25, 2017. The festival that is the most important in Maharashtra and is celebrated with much pomp and fervor all over the state is making devotees excited. Mumbai, the capital of Maharashtra is known for some breathtaking and huge Ganpati pandals and idols that compete against each other for prizes in various categories. Lalbaugcha Raja is the most popular and revered Ganpati idols of Mumbai. People throng in hordes to come and catch a glimpse of their favourite elephant god. 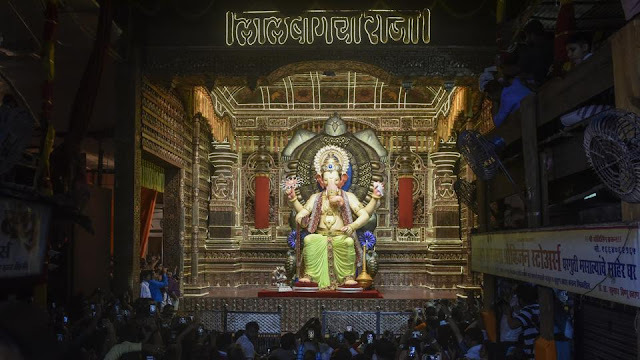 Many people believe that this particular Ganesha idol has the power to fulfill heart’s desire and hence people wait in queues for hours to see the huge, gigantic idol. Legend has it that people who wait patiently for their turn to pay their respects to the Ganesha idol get their wishes answered and their sorrows and obstacles are taken away. Lalbaugcha Raja idol is kept for eleven days and on the eleventh day, it is submerged in the sea on the auspicious day of Anant Chaturdashi. Ganesh Chaturthi or Vinayak Chaturthi will be celebrated this year on August 25, 2017, whereas Anant Chaturdashi will be celebrated on September 5, 2017.